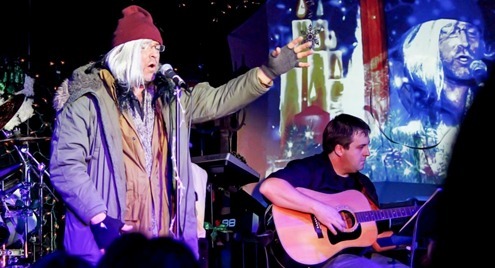 Christmas Jam began in 2010 as an all ages, holiday themed rock concert meant to bring the local music scene in the Salt Lake City, Utah area together to celebrate the season and serve the less fortunate through the gift of music. What happened that first year was nothing short of miraculous and we have enjoyed overwhelming growth in both attendance and participation with each passing season. The cast and crew of Christmas Jam have donated hundreds of hours each year to bring this production to life for delighted audiences of all ages. Not a single participant is paid for their performance. Each and every dollar from every ticket sold has been used to fund the venue and equipment necessary to share this gift with our community. Everything above and beyond those costs has been donated directly to the charity being supported each year. Following four sold out shows in 2012, we began an ambitious effort to more fully organize our efforts in the hope and belief that we could use this family friendly holiday production to draw even more attention to those less fortunate around us and direct ever increasing funds toward their support. This has become our mission and our cause. In early 2013, Christmas Jam of Utah, Inc. was formed with the singular goal of organizing our efforts and leveraging the magic that comes from this production to more efficiently channel our energy and direct 100% of the proceeds generated by the shows to our cause. As part of this initiative we are looking to the community to help us fully fund the production prior to the show In doing so, the production costs will no longer come from the ticket sales and allow us to donate 100% of those proceeds directly to charity. Christmas Jam of Utah, Inc is a 501(c)3 Non-Profit Corporation. Bringing the magic of Christmas Jam to the community is our gift to you. By supporting this production, we can take production dollars and multiply them through ticket sales while providing a unique, one-of-a-kind holiday music experience that you will find no where else.